Made by request for my friend's daughter's third birthday. 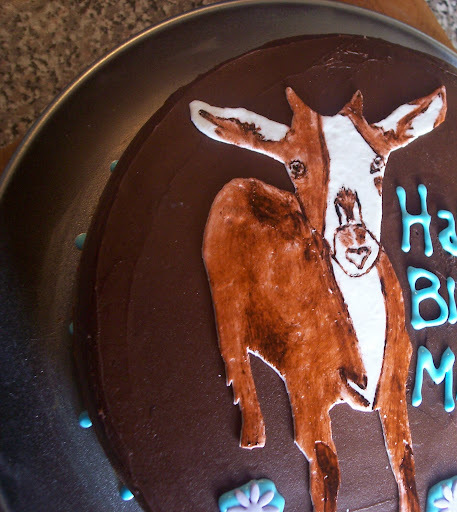 Not everyday someone wants a baby goat cake! This is just about the tastiest chocolate cake on the planet. Super moist, my go-to chocolate cake. Below is the recipe for both the cake and the icing. Grease 2 8-10 inch round cake pans. I used spring form. With mixer still on low, add the coffee and stir just to combine. Pour the batter into the prepared pans and bake for 35 to 40 minutes, until a cake tester comes out clean. Cool completely in pans. Chop chocolate roughly or break into pieces and place it with the cream in a heat proof bowl or pan over another pan full of boiling water (or a double boiler if you have one). Stir until its all melted. There will be a point when you get worried about the flakey bits floating in cream, but they will all melt eventually and you'll have a creamy looking bowl of chocolate. Cut up room temperature butter and mix it on high with the chocolate, vanilla and icing sugar until fluffy. It might appear to runny, but don't worry. Refrigerate it for at least 30 minutes. It'll stiffen. If you leave it in the fridge, a quick pop in the microwave will also make it spreadable again. This stuff would make excellent truffles. SO, so tasty a few days later left in the fridge! 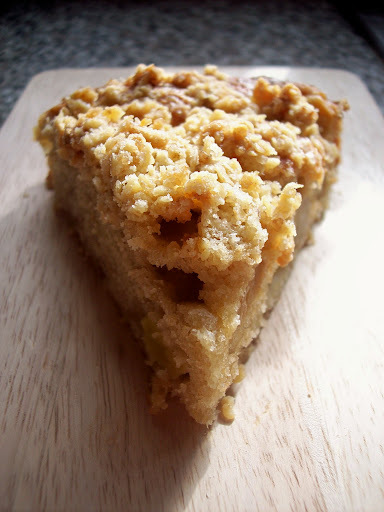 Apple Cake for a Birthday? It's my partner Cormac's birthday. He's turning 21, again, of course ;). He requested an "apple pie or cake thingy whatever". So, I figured as long as I used up the apples in the kitchen I'd be fine. 3/4 cup apple sauce (or any extra large apple or 2 small ones, I just happen to have some applesauce already in the fridge to use up). Grease a 9" or 10" round pan... I used a springform pan to make my life easier and lined it with baking paper. You could probably use a ~10" square pan. Peel and slice your apples (if you really care, you can soak them in cold water with a few squirts of lemon juice to prevent browning but it really doesn't matter since you're just tossing them in the cake in the end). Sift flour, baking powder, salt and cinnamon together. Melt butter and leave it to cool. In a another bowl or your mixer the eggs and sugar. Mix on high until its nearly syrupy and a bit pale colored. ~3 minutes. Add the cool melted butter and the vanilla to the egg/sugar mix. Add the applesauce and mix (if you have it). Add the sliced apple pieces, mix gently until they are coated. Add in the flour mix and mix until its well combined. Start your crumble topping in a separate bowl. Use room temperature butter, and toss the oats, butter, sugar and cinnamon together. Squeeze it together until it forms pebbles of crumble topping. 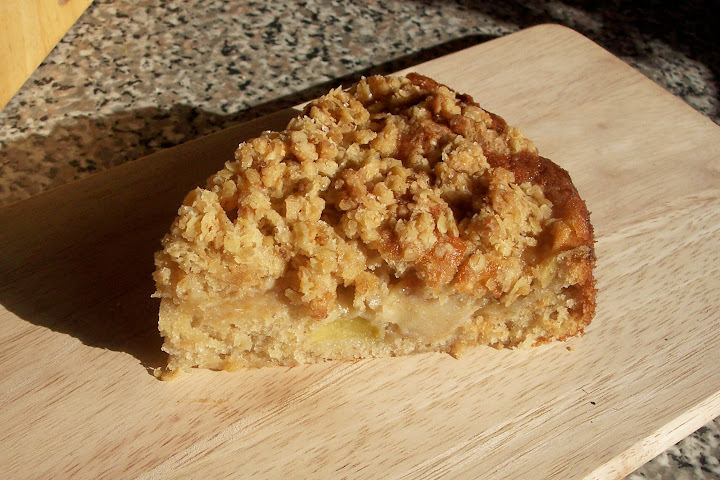 Pour into your greased pan, sprinkle on the crumble topping, stick it in your oven for 50 minutes. I love brownies. I, like many children, grew up eating brownies. I've been in search for a long time for the perfect brownie recipe. I've said it before and I'll say it again, a cake-like brownie is not a brownie. It's a cake. Brownies are slightly crunchy on top and chewy in the middle. And these brownies fit the bill. I'm a huge fan of David Lebovitz, as I would be of anyone who spends most of their days fluting around Paris. So, I trust his suggestions. My recipe is an adaptation of his brownie recommendation. --edit-- sorry guys, my changes are now secret but go ahead and try thrr original which is also super tasty! 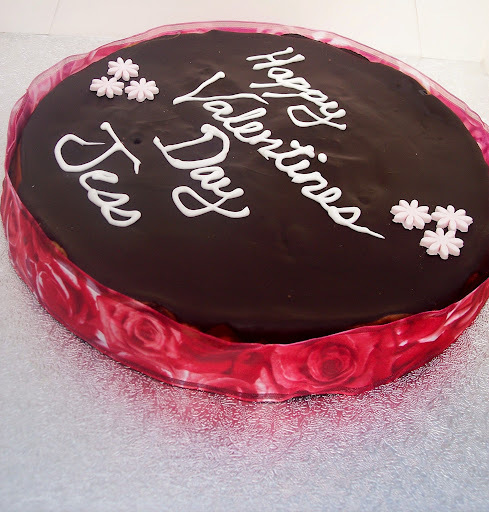 Happy Valentine's Day with Cheesecake! Valentine's Day is upon us and I had a request from friend for a cheesecake. The conversation mentioned both chocolate cake and cheesecake so I knew I needed to incorporate chocolate. So, while I should have been baking my dearest something for lover's day (hey, he said he wants to lose some weight anyways! ), I was whipping up this amazing cheesecake. I would have loved a slice! The cheesecake recipe I have is a basic play on a New York style cheesecake (and a cheesecake isn't a cheesecake to me unless its been baked). You can use the basic recipe and throw in whatever you'd like. Melt down some white chocolate, throw in cookie pieces (I used Oreos), pieces of candy bar or chocolate chips. Leave it plain. Go crazy. Now, if you want just cheesecake, no thick crust or topping, go to the Lindy's link below and use the full recipe. I cut it down because I wasn't aiming for a thick cake. Crust, that's up to you. I used chocolate cookies, oreos, a bit of sugar and a bit of butter. I don't measure anything, but you can look this stuff up. I usually prefer using graham crackers for cheesecake crust. 2 vanilla pods, seeded (or 2 tsp vanilla... you can omit if you don't like vanilla). Preheat that oven of yours to max. 450F, 500F, 230C, whatever you've got. If you have a lower rack, put it on the bottom and put a pan of water in the oven. Add eggs one at a time, then the egg yolk. Don't over beat, just beat it until mixed. On a low speed. If you mix it at a high speed you are going to put bubbles into your cheesecake and its going to crack in the oven. Gently stir in your mixins, if you want any. Pour it in a springform pan, 9 or 10". Then, run a knife through the batter in a S-shape a few times. Put in the oven for 10 minutes. In 10 minutes, cut the oven down to 250F/120C. For one hour. DO NOT OPEN THE OVEN. EVER. AT ALL. FOR THE WHOLE HOUR AND TEN. You'll crack that cheese cake. On my cake, I waited for it to cool, melted down some chocolate and made sure it stayed tempered, then poured it over the top of my cheesecake and put it in the fridge overnight. Perfect. 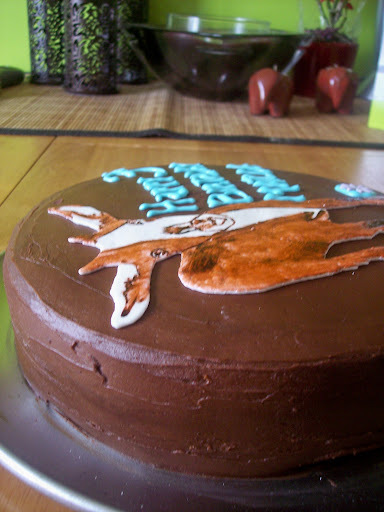 The writing on my cake is in royal icing. I'm promising everyone that I will be trying and perfecting at least one recipe a month. 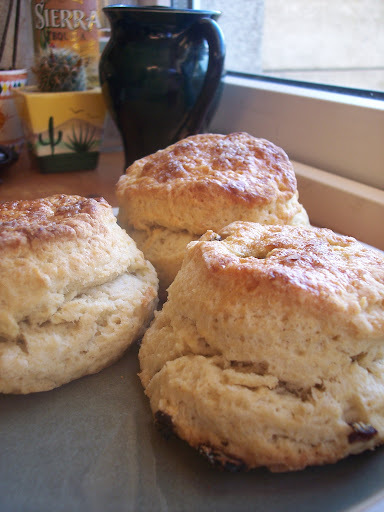 I had an order for scones recently, and its been a while since I made them. I decided what a great way to start my resolution. Any scone I've paid money to eat, in Ireland anyways, has been quite typically dry and tasteless. I was determined to adapt a recipe to be much more decadent without being over the top. I think I'm getting there. In my research, I've found that scones seem to differ region to region. These are somewhere between a cake and a biscuit, a bit flaky but tender not dry. Plenty of rise. That's the perfect scone, to me. These just melted in my mouth with a cup of coffee. Now, I'm not one for loads of cream and jam but I'm sure that they would be even more delicious served up that way! I'm thinking of messing around with the recipe a bit more but all in all these are top notch. 1 cup of sultanas (or whatever dried fruit you want. Preheat oven to 400F/200C (this is so important. For good rise, you need that initial blast of heat. So, crank up the oven before you even start the dough. Mix 4 cups flour, 1/4 cup sugar, the baking powder and salt in your mixer (with a paddle or food processor. Add the cold butter and mix at the lowest speed until the butter is the size of peas. Using a mixer/processor keeps the dough cold and gets it mixed quick. Combine the eggs, vanilla and heavy cream. Slowly pour into your flour mixture with the mixer/processor on low. Expect lumps-- that's going to be your delicious flakes! Toss your sultanas or other dried fruit in 1/4 cup flour and add them into your dough. Do NOT overmix. DO NOT OVERMIX! (don't overmix it). Dump on the counter-- if its very wet, just dust the outside of the dough with flour. Try not to mix more flour in. Lightly pat the dough into a ball so you can roll it out, about 3/4 - 1 inch thick. Cut as you want. 3" rounds, wedges, what have you. Brush the tops of the scones with egg wash. Just the top. If you go down the sides it will not rise as high. I sprinkled the tops with demerera sugar. Bake 15 minutes. Check on them around 10 minutes though, my oven is variable and not all ovens are equal. You don't want to over bake. They should be done when the tops are golden brown.